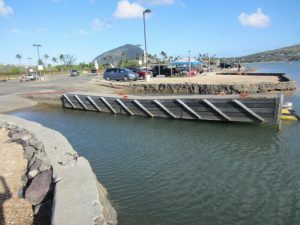 (Honolulu) –Access to the Maunalua Bay Boat Ramp will be closed next week from March 25th to March 29th as contractors will be removing the condemned pier. Weather permitting and if the contractor can finish the work earlier, the boat ramp will re-open at that time. Boaters will need to make other accommodations to launch from other facilities during the closure. The contractor is JS Int’l, Inc. and the cost for removal of the collapsed pier is $24,910. The DLNR Division of Boating and Ocean Recreation appreciates boaters patience and understanding during the removal process.